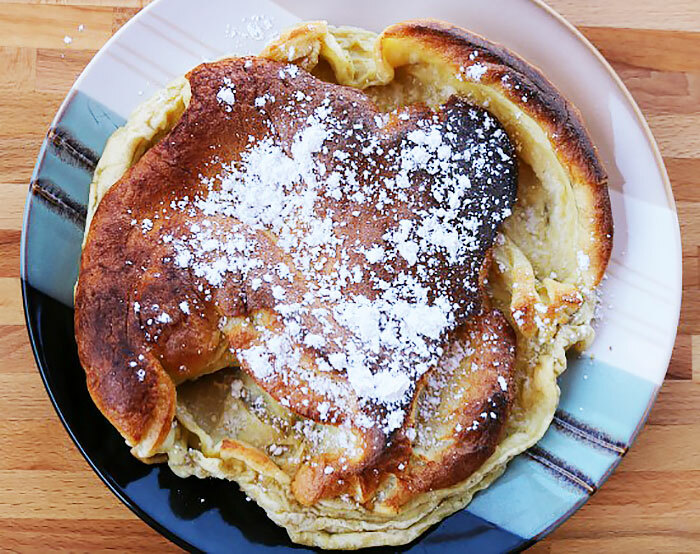 If a crepe and a pancake got together and had a child – you’d have a dutch baby. It’s sort of like an eggy, fluffy pancake. 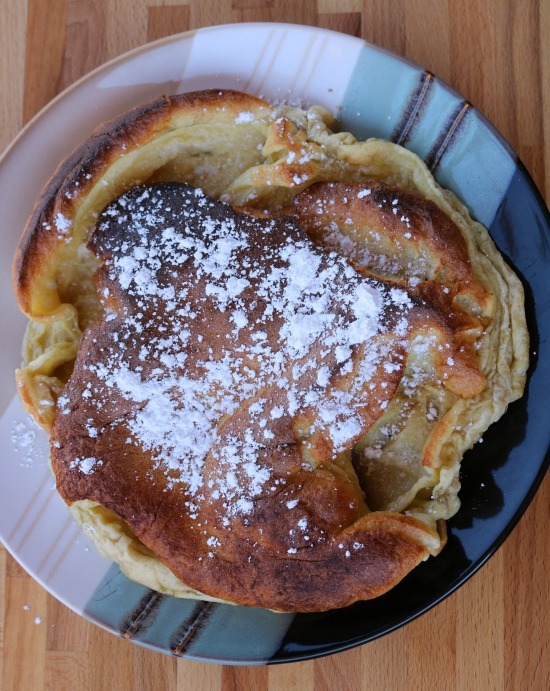 Not surprisingly, when we’re talking about a dutch oven dutch baby it tastes even better. I don’t know what it is, but dutch ovens make food taste better. Top it with a little Nutella®, berries, or just powdered sugar and it’s possibly the best campfire breakfast ever. Another huge plus is that it’s incredibly easy to make over the campfire and you can prep the ingredients ahead of time and simply mix, pour, and cook! Campfire recipes with easy prep and easy cleanup are my favorite. You can grill sausages or bacon while you wait for the dutch baby to cook and you’ve got a very filling meal in a short time. This recipe makes a pretty good sized dutch baby. It nicely feeds my family of 5 when paired with other breakfast foods. Or it makes a great dessert! Powdered sugar, Nutella®, berries, or other fruit – get creative! 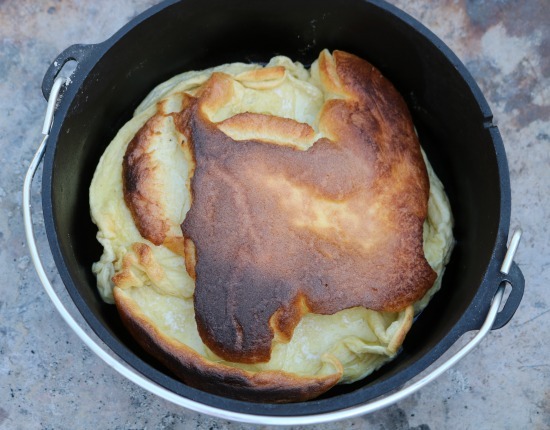 In researching how to do this over a campfire, I stumbled onto a few recipes that made a massive dutch baby. We’re talking about a 9 egg one! Since my dutch oven is only a 10 inch, 4 quart version I I knew I needed to scale down a bit. 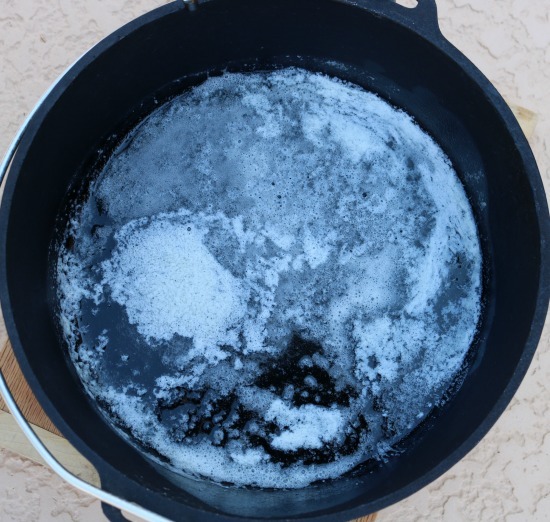 If you own a 14 inch, 8 quart dutch oven – feel free to triple this recipe and it should nicely fit. With this recipe you can get the dry and wet ingredients prepped and ready to mix together at the campsite. I suppose you could mix everything together ahead of time, but I haven’t tried it and I usually keep wet and dry separate until just before cooking time. 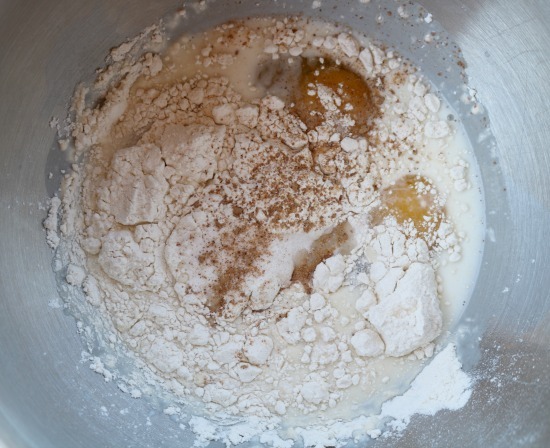 Using a plastic zip top bag – mix together ½ Cup flour, 1 Tbsp sugar, and a sprinkle of nutmeg. Seal and shake ingredients until fully mixed. Stash this with your non-refrigerated food stuffs to take to the campsite. Whisk together 3 eggs and ½ Cup milk. An easy way to transport this to the campsite is to place it in an empty (clean!) water bottle. A funnel can make getting your ingredients into the bottle a little easier. The plastic bottle is easy to stash in your cooler before you head out to the campsite. I used 20 charcoal briquettes for this recipe and it came out just right. Because you’ll want to cook with white hot briquettes, the first step should be to get those briquettes heating up. 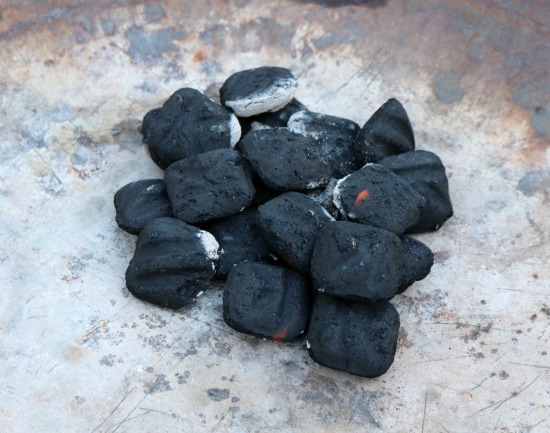 Stack all 20 briquettes tightly together or use a charcoal starter and get them heating. I usually shoot to let the briquettes alone for about 15 minutes before they’re cooking-worthy. Mix together all ingredients except butter and toppings. 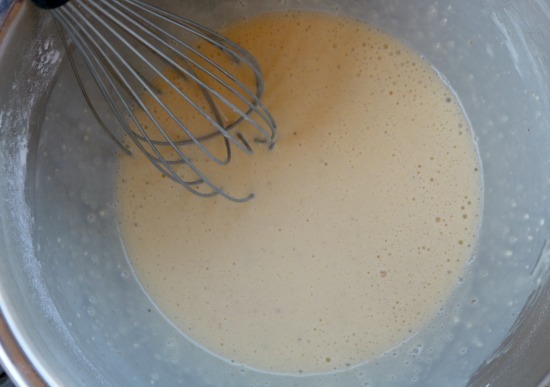 Whisk everything together until your batter is nice and smooth. Lumps are bad for dutch babies. Ideally, the batter should sit and rest for a few minutes while your briquettes are getting nice and hot. Stir and set that batter aside while you’re waiting. 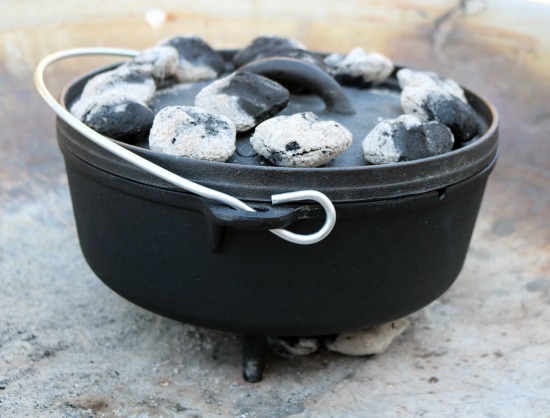 When the briquettes are nearly ready (think about 2-3 minutes before they’re done) – place your dutch oven on top or right next to them to get it warming up. 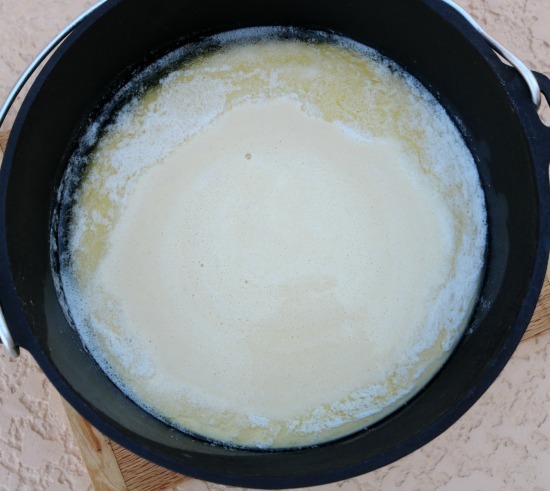 Once the dutch oven is warm, take that butter (all of it) and place it in the bottom of the dutch oven and wait for it to melt. It should be totally melted before you proceed. 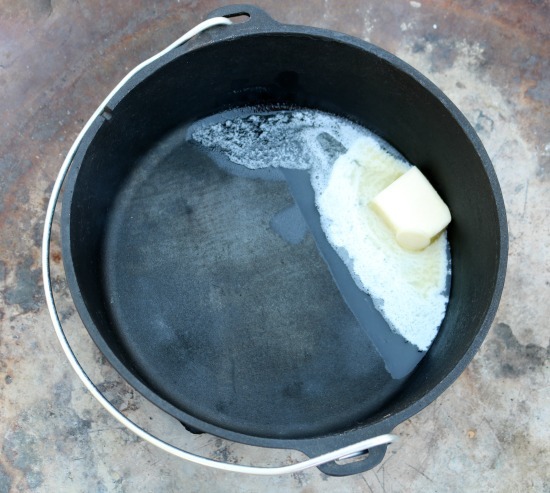 Carefully take your hot pads and swirl that butter so that it coats the sides of your dutch oven to prevent sticking. Now you’re ready to cook! Separate your briquettes and place 7 in a semi-circle. Next, pour your batter into the dutch oven. I usually pull it off the fire to do this, but if you can swing it you can do this while it’s still on there – just be careful. Then, place your dutch oven on top of the 7 briquettes. Put the lid on, and then place the remaining 13 briquettes on top of the lid (using those metal tongs you brought). Let the dutch baby cook for about 20 minutes and then check for doneness. It’ll turn a nice brown and the middle will be set (i.e. not liquid) when it’s completely done. One other thing to be aware of is that when you lift the lid it’ll sink down almost like a souffle. Don’t worry – it’s supposed to do that! It should look something like the picture below. So yummy right? Carefully remove it from the pan (it should slide right out thanks to all that butter) and doctor it up however you like. My kids are huge Nutella® fans, I like berries and powdered sugar, my hubby likes it with just berries. There is no way to do this dish wrong! Look at all that delicious! Happy campfire eating!